WIKA's connecting parts enable the secure storage and handling of environmentally hazardous SF6 greenhouse gas in the equipment provided for this. The connecting parts have been precisely and specifically optimised for this application. The ease of mounting and removal, as well as being 100 % tested for leak tightness, make these connecting parts safe and reliable interfaces for the filling and maintenance of the equipment. In order to meet the high demands for quality, the robust design has passed extensive testing with actuation tests, tests in atmospheric conditions and shock tests. The connecting parts are manufactured from high-quality aluminium, brass and stainless steel. On request, the connecting parts can be supplied with a material certificate. 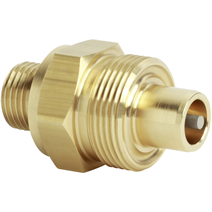 The product range for connecting parts with nominal width DN 8 consists of self-closing valves, matching couplings and soldered and weld-in connections. For the connection of DN 8 to other nominal widths and connections, the appropriate adapters and components are available. A protection cap offers mechanical protection and additional sealing. By using WIKA´s connecting parts, the maintenance-free and reliable separation of SF6 gas compartments from the environment is made possible. In this way, not only is the escape of SF6 gas prevented, but also the ingress of moisture.